Okay, let’s face it. Summer vacation is walking through the door and that can mean a lot of things. Vacations with your family, the days seem longer, and hot weather. But where should we visit? I mean, a place that both teens and adults will love? My vote’s for the beach! I recently visited Clearwater Beach, FL, and found it to be a perfect place to vacation with your family. Pier 60 on Clearwater Beach is a cool place to take photos. I live in the Midwest where it seems winter is worse than a crazy ex-girlfriend. So, by the time spring is supposed to arrive, I’m so ready to whip out the shorts and head to a warmer climate. 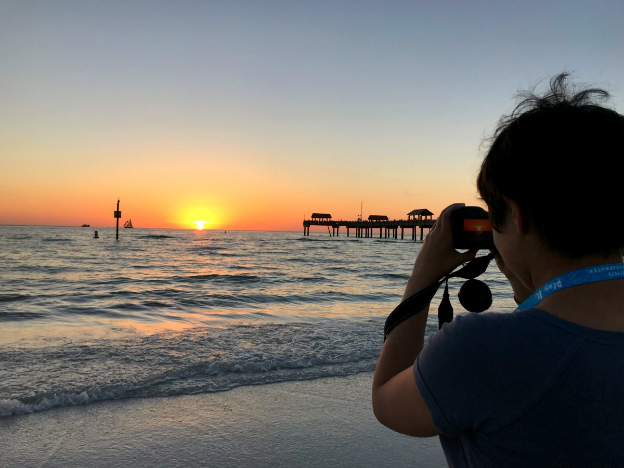 My family loves visiting Florida this time of year – so why not visit Clearwater Beach? I think the better question is why visit Clearwater Beach, right? Here’s six great ones. Check out the color of that water! Let’s just get this one out of the way. Clearwater has a beautiful beach. The water is lovely and the sand is gorgeous. Clearwater is also known for its sugar sand. This sand naturally white and soft and looks like… well, sugar! Renting a private beach cabana is a great way to stay cool and not get sunburned. You can rent covered beach cabanas and spend the day hanging out by the ocean without worrying about sunburn. Shelling at Sand Key Park. When I visited with my mom, we spent time looking for shells. If you want to look at the sugar sand strip of beach, you’ll find some shells. They’re really pretty, but they are pretty small. My pick is to take a quick drive to Sand Key Park where the shells are huge and beautiful. Visiting the Clearwater Marine Aquarium was an eye-opening experience. When I was younger, watching “A Dolphin Tale” and “A Dolphin Tale 2” were a must. It was fun to see how Winter (and then Hope on the second movie) overcame obstacles. Heading to Clearwater, I learned that I’d have the chance to check out both dolphins at The Clearwater Aquarium. One thing to note is that Clearwater Aquarium is not an “aquarium” in the usual use of the word. It’s more of an animal hospital than an aquarium, which I love. The animals that live at the aquarium are there because each is unable to be returned to the wild. Check out Ron Jon’s Surf Shop for a blast from the past! Clearwater Beach has a really fun beach vibe – and with that comes shopping! While there are some smaller shops and vendors right on the beach, I loved walking up and down Mandalay Avenue. You’ll find plenty of souvenirs (some of which are a little… unusual). Shops like Freaky Tiki Surf Shack and Ron Jon Surf Shop are super fun to shop at to find nice swimsuits and cool beach clothes. Did you know there’s a nightly festival in honor of the sun at Clearwater Beach? Yep! The Pier 60 Sunset Festival is just that: each night families gather along the beach and on Pier 60 to watch the sun go down. Before the sun actually sets, you can walk along the pier and shop for everything from jewelry to paintings and carvings – all from local artists. A sand sculpture of Edgar Allan Poe at Pier 60 Sugar Sand Festival. If you’ll be visiting Clearwater Beach in the springtime, heading to the Pier 60 Sugar Sand Festival is a really good idea. Located right on the beach, world-famous sand sculptures create giant displays in honor of American heroes, sea creatures – you name it! They even take your picture with one! At night, the sculptures are lit up beautifully and the colors really bring out the details. During the festival, there are plenty of free activities, too: movies at night, concerts and shows from buskers, and even a chance to try your hand at sand sculpting if you wanted. Not to mention all the fun street performers! Heading out to Clearwater Bay on a Dolphin Adventure tour. There are tons of options to check out Clearwater Bay and even The Gulf if you want to get on the water. Sitting on the beach, I saw everything from a pirate ship-style cruise that shoots pretend cannons to yachts to smaller boats with one thing in mind: dolphin watching. During my visit to Clearwater Aquarium, I checked out the Dolphin Adventure Tour. Part dolphin watching, part educational, it’s a fun lesson in local dolphins that live in Clearwater Bay. The tour lasted 90 minutes and was super calm, which is great for those of us that get sea sick easily. Another cool way to see dolphins is with the Little Toot Dolphin Adventure where they guarantee you’ll see a dolphin on your trip. This dolphin-watching tour is really exhilarating as the dolphins like to ride in the tugboat’s wake so they get super close to the boat. It is a bit bouncy, though, so make sure you’re prepared ahead of time with Sea Bands or Dramamine if you get motion sickness. There isn’t a bad seat in the Clearwater Threshers’ Stadium! Do you know what a thresher is? Neither did I until I visited Spectrum Field, home of the Clearwater Threshers. It’s a a type of shark that lives on the surface of the water. They hunt in pairs and use their tails to thresh the water to tightly pack herd fish. Measuring up with baseball mascots. A minor league team supported by the Philadelphia Phillies, the Threshers have family-friendly baseball games that are fun for kids and teenagers. The smaller kids can play at the playground on the upper level and teenagers can dive into the inexpensive food including hot dogs and hamburgers. Did I also mention that they have super fun weekly events? Because they do! There are events such as Dollar Tuesday where they have walk-up tickets, drinks, and snacks for a dollar! During the summer, you can also take part in The Dog Days of Summer. On Sunday home games you can bring your furry friend with you for six dollars. The money from the tickets will go to local pet charities. They also have fireworks on Saturdays! All photo credit goes to Karyn Locke.